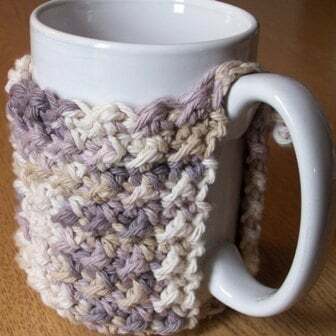 Here is another free crochet pattern for a mug cozy. 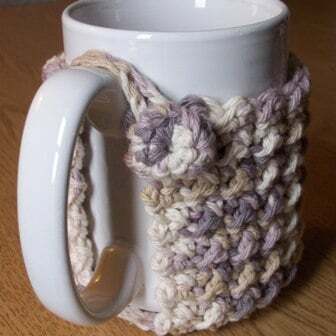 It’s actually a coaster/cozy in one – it protects your tables while keeping our coffee or tea nice and warm. It’s only one layer of fabric around the cup, but believe it or not, it really does make a difference. I used the crunch stitch for this cozy pattern, and it resulted in a very nice texture. The crunch stitch is basically like the seed stitch, only you work it with the half double crochet and slip stitches. After the initial row the half doubles are worked into the slip stitches and vice versa. Very easy, yet a pretty stitch to work with. To keep it on secure, I crocheted up a button to hold the top part of it together. But you can use any kind of button that you like or have on hand. For something on the road, check out this easy popcorn crochet cup cozy, or this puff stitch sleeve. Yarn: Bernat Handicrafter or any similar cotton yarn. Gauge: Measures 2″ across first 3 rounds. Finished Size: Fits a 3.25″ diameter mug. Rnd 6: Sc in each st around. Do Not Turn. Row 2: Ch 1, sc in first sc, (sl st into next hdc, hdc in next sl st) to last sc, sc in last sc. Turn. (38 sts) Rep row 2 until you have reached a desired height. I did 14 rows for mine. Do not fasten off. Ch 10, sl st into last st made to form loop for button. FO. Rnd 1: With G/6-4.25mm hk, Ch 2, work 8 sc into 2nd ch from hk, place st marker in last st made. Rnd 2: Work 1 sc in each st around. Rnd 3: Encase rnd 2 by working 1 sc into each st of rnd 1. FO leaving a long tail for sewing. Weave the tail end through the sts of rnd 3. Pull the tail tight and sew button onto top corner opposite from the loop as pictured below.